Cabo, it seems—despite its perfect weather, incredible popularity, and ideal location—has gotten a bad rap with sailors. Too expensive. Too loud. Was better in the 80s. Ruined by the cruise ships. And so on. So with Cabo as the third and final stop on our trip down the Baja peninsula, we weren’t quite sure what to expect. But we were excited for a taste of civilization after the remoteness of our previous stops, and we had some practical needs, too: We wanted to stock up on food, and we wanted to buy a new outboard motor for our dinghy. Cabo seemed like our best shot at all three. ‘We arrived in Cabo on a Sunday afternoon, and 24 hours later we were wondering what all the complaints were about. It turns out that Cabo’s not so expensive, if you know where to look. It’s absolutely possible for cruisers like us to get things done. And a bit of serendipity at Wal-Mart (yep!) helped Cabo exceed our expectations. Here’s our experience. Armed with little more than the Yelp app and a Lonely Planet guidebook, we were able to escape the harbor-side vortex of $15 margaritas and enjoy some delicious, inexpensive food. 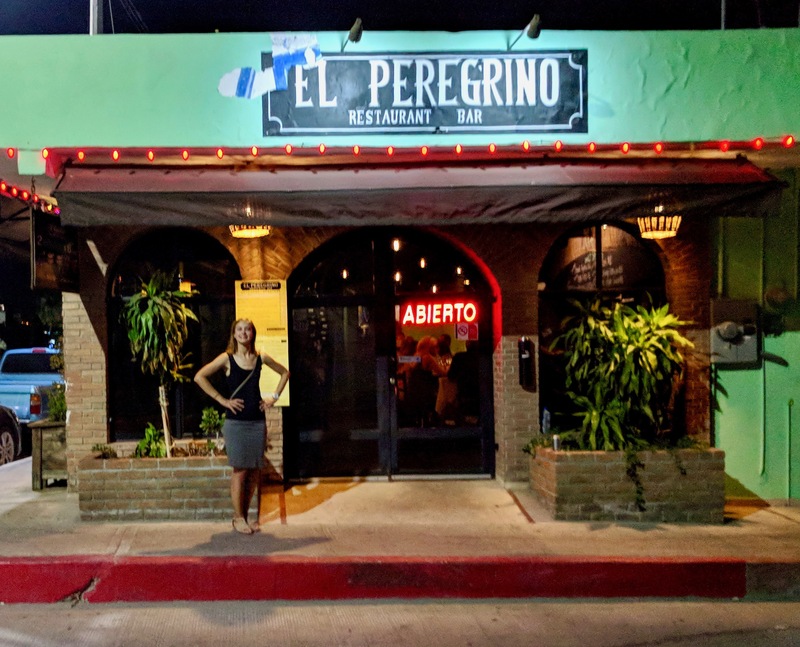 For example, El Peregrino was so good that we ate there twice—the octopus with ajillo peppers was truly amazing—and both meals were less than half the price of a comparable dinner in San Francisco. For lunch one day, we had a genuine feast of tacos and beer at The Tortilla House for about $15. 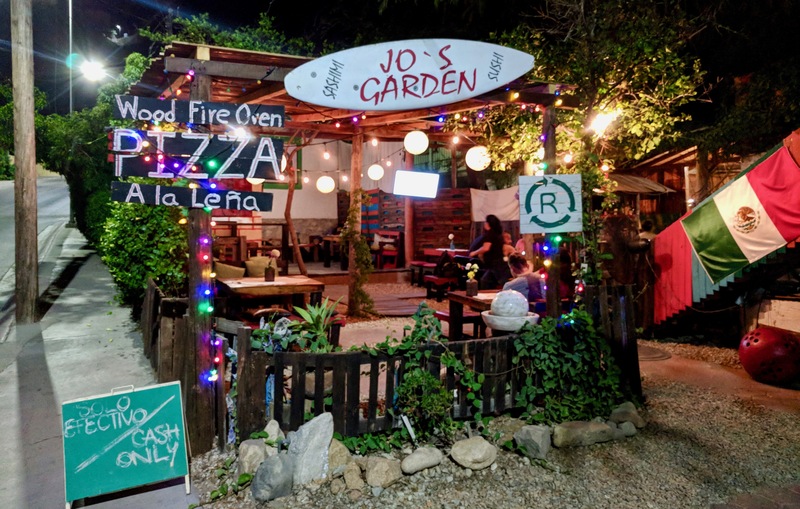 But for cheap, charming, and tasty food in Cabo, Jo’s Garden was our favorite. Only half a mile from the marina, up a hill into a residential neighborhood, we felt like we were back on St John in the Caribbean. Two pizzas, two beers, and two glasses of wine set us back $25. 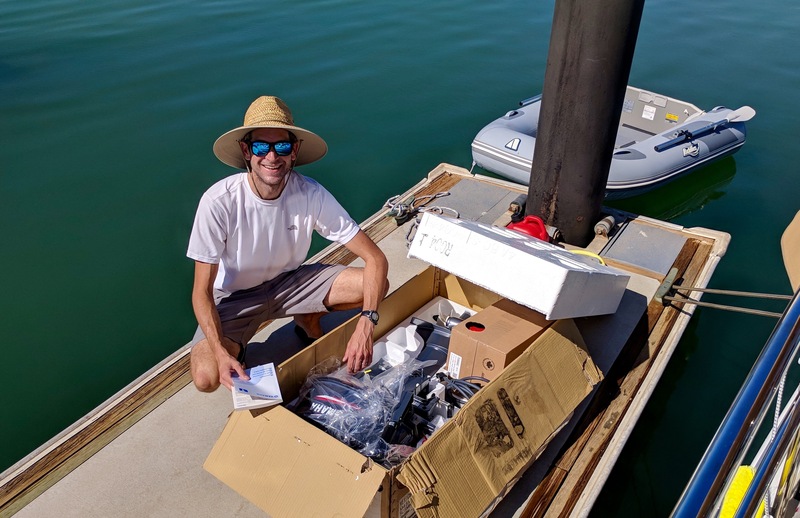 We decided in Magdalena Bay that we wanted to buy a new outbound motor for our dinghy. We were warned by fellow cruisers that this would be impossible in Cabo. But we decided to inquire at the marina office, who sent us next door to the affiliated boatyard. “What brand do you want?” asked the boatyard office manager. “We’re not too picky… Nissan, Yamaha, Honda, Suzuki…” I said. He flipped through a binder of business cards, then picked up the phone. After a brief conversation (sadly, my Spanish isn’t good enough to catch more than a few words), he handed us a business card and sent us up the street to a Yamaha dealer. There we met Isaac. Isaac is fast-talking, eager to help, speaks excellent English, and—it turns out—just opened the new Yamaha dealer in Cabo. 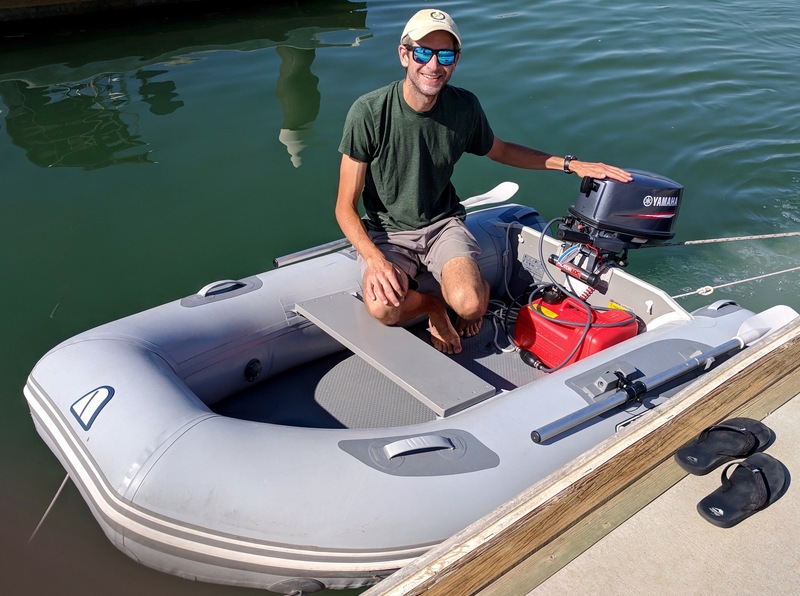 Isaac was able to get a new 5-horsepower engine shipped from Mexico City, and he personally delivered it to our boat a few days later (and took away the old one for us). Stocking up on stores (that’s sailor talk for “non-perishable food products”) was on our to-do list, so we scheduled a trip to Wal-Mart. We were somewhere between the salsa section and the freezer aisle when Michelle leaned in and whispered, “That woman writes one of my favorite blogs! I kind of want to say hi.” We played it cool and took a lap through produce, then circled back so Michelle could say hello. When we approached—it was Genevieve of It’s A Necessity, a former cruiser now living in Todos Santos, Mexico—we saw that she was talking to someone else. Michelle decided to say hi anyway. That “someone else” was another cruiser—and a young one, too: Vikki Fennell from Taliesin Rose, who we had spotted at Santa Cruz Island and read about in Latitude 38. We made plans to get drinks later that night, aboard Taliesin Rose in the Cabo marina. Not only did Michelle get a unexpected fangirl moment out of our trip to Wal-Mart, but we made some new friends, too. Now we’re moored at Puerto Los Cabos Marina in the “other” Cabo—San Jose del Cabo—to hang out with my sister and brother-in-law, explore the area, and catch up on some writing (hello). Tomorrow we plan point our bow into the Sea of Cortez and spend a week or so anchoring in some of the more remote bays and coves there. Then we’ll be ready for another dose of civilization—either La Paz or Mazatlán. Stay tuned. Happy Thanksgiving! Jason and Julie s/b at same marina on Knotty Boo through the weekend. I love how small of a world it is sometimes! Vikki Fennell is a member at SFYC and is an awesome woman and fantastic sailor! Haha, I suppose I have! Thanks for reading and leaving a note! Glad you met Vicki and family! So are we! After chatting with them in Cabo we realized that when you tried to introduce us back in the summer, they were in the final days of preparations—a little busy! Small world, Vicky and I went to college together and I’ve been following their cruising story as well. So great to follow your trip! After spending Thanksgiving cruising Catalina Island, we’re inspired to get out there as well. Ah, super cool! Let us know if you ever want to chat about cruising stuff.